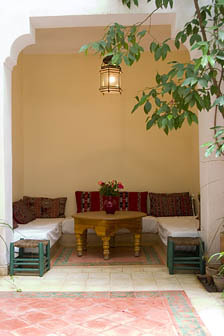 A stay here will give you a real taste of living in the Medina. Leaving the bustling street, you turn into a small alleyway and arrive at a heavy wooden door. Once inside you will be greeted by the unexpected peace and quiet of the patio, with its rose-petalled fountain and orange trees. There are two welcoming lounges where you can enjoy traditional mint tea, or you may choose to relax in the b'hou - an alcove that opens out to the patio. Upstairs, the sun is playing through the columns and ironwork of the gallery, filling the bedrooms with ever-changing light. The roof terrace is the sun's kingdom, where you can soak up the warmth in winter, or enjoy the cool dusk in summer. It's an all-season paradise. These are a few of the pleasures we invite you to enjoy while spending some time at Dar Touyir. 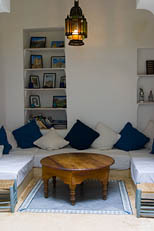 Over 120 years old and formerly douyiria and service rooms for the next-door Riad, Dar Touyir et Dar Tibibt, 2 terraced houses, have been renovated by Belgian architect Quentin Wilbaux, respecting the local traditions. The hallway leading from one house to the other, once closed, has been reopened, allowing more space and possibilities.